Heat gas or charcoal grill. In small bowl, combine mayonnaise and 2 teaspoons salad dressing; blend well. Set aside. Sprinkle mushroom caps with salt and pepper. When grill is heated, place mushrooms on gas grill over medium heat or on charcoal grill 4 to 6 inches from medium coals. Cover grill; cook 5 to 8 minutes or until thoroughly heated, turning once. Meanwhile, brush cut sides of rolls with 1/4 cup salad dressing. 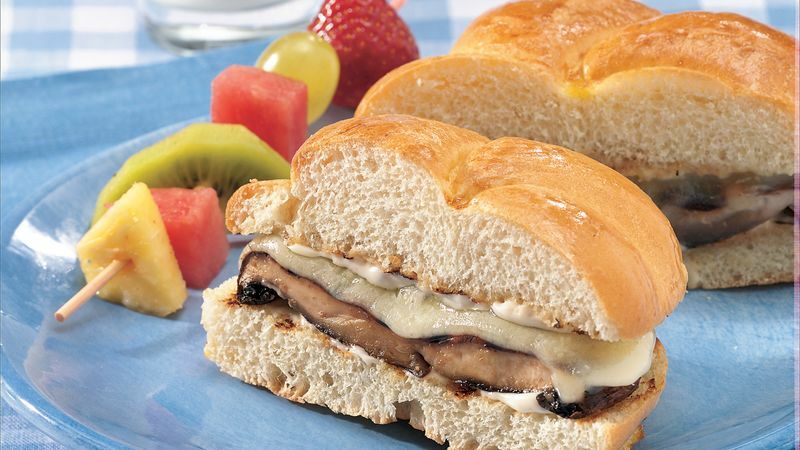 During last 1 to 2 minutes of cooking time, place cheese on mushrooms and place rolls, cut side down, on grill to toast. Spread toasted rolls with mayonnaise mixture. Serve cheese-topped mushrooms in rolls. Always remove the stems from portobello mushrooms, as they are too woody to eat. Portobello stems can be saved and added to soup stock. To broil mushroom caps, place on broiler pan; broil 4 to 6 inches from heat using times above as a guide, turning once. Meanwhile, brush cut sides of rolls with 1/4 cup salad dressing. During last 1 to 2 minutes of cooking time, place cheese on mushrooms and place buns, cut side up, on broiler pan to toast.